Getintothis on why Liverpool’s musicians and creative community deserve championing. Back in 2007, just as I began writing Getintothis, I was contacted by Thurston Moore‘s London-based PR asking if I’d send her Liverpool fanzines, flyers or weblinks so that she could gauge what was going down on the Merseyside music scene. A thorough sift through Bold Street, the Ropewalks, Hairy Records, Probe and every nook of the independent scene threw up little but Tom George‘s Slacker Sounds magazine. Push forward 12 months and the Capital of Culture sparked a regeneration of not just the commercial sector but ignited a renaissance in the arts as a whole new wave of innovation began to seep through the city’s pores. With Liverpool Sound City, Liverpool Music Week, the formation of the Kazimier and its respective club as a performance space, pockets of promoters (EVOL, Samizdat, Meshuggy, Harvest Sun, La Racaille etc) prepared to take risks on projects which had little financial guarantee – and of course the rebirth of a whole host of scenes within a scene, the city gave rise to the strongest sonic landscape for years. As we approach the end of 2011, Liverpool is positively thriving with fanzines, blogs, photographers, promoters and most of all, new music – a complete shift from when Getintothis began. Which brings us to next year. In 2012, Getintothis is five and in celebration of a city with three music festivals competing for UK honours (Sound City, Music Week and Creamfields), a host of celebrated studios and DIY labels, the national music press’ top hype band (Outfit) and musician (Forest Swords) and a stream of others garnering widespread global attention, I’ve launched a new Liverpool music award – the GIT Award (that’s an acronym of Getintothis – insert your own joke!) – championing the best Merseyside recordings of the year. Think of it as the Scouse Mercury Prize – however, the only criteria being that it has a clear connection with Liverpool; ie: the record was made, produced or recorded by Liverpudlians. Unlike the Mercurys, there will be a transparent judging panel, thus far comprising Vice magazine editor Andy Capper, EVOL‘s Steve Miller, Waxxx magazine‘s Joshua Burke, myself and Bido Lito! editor Craig G. Pennington. Further as many grass roots musicians won’t record a full album during the course of a year, we’re asking for four tracks be submitted to be eligible for entry – think of it as an old school four-track EP. The GIT Award will celebrate Liverpool’s rich sonic diversity – embracing all forms of music from hip hop to electronica, from country to punk and folk through to rock and roll and metal. The GIT Award is open to all. What started as a little idea, has grown into something to be proud of, and I’m delighted to announce a stellar list of sponsors, both from inside and outside the music community, have added their considerable cultural and commercial heft in supporting the inaugural GIT Award. These include Liverpool Sound City, Liverpool Music Week, Cream, Creamfields, Vice Magazine, The Quietus, Liverpool Vision, ACME, It’s Liverpool, Liverpool City Council, Culture Liverpool, FACT Cinema and Art Gallery, Liverpool Museum, LIPA, Probe Records, The Music Consortium, WAXXX Magazine, Sandhills Recording Studios, Elevator Studios, The Motor Museum Recording Studios, Dawsons, Resurrection, Lost Art, Weavers Door, Bold Street Coffee, The Green Cauldron, Cains Brewery, The Bluecoat, Static Gallery, The Masque, Leaf, Sentric, CMU Daily, EVOL, Mellotone, Harvest Sun, Samizdat, Behind The Wall Of Sleep, Screenadelica, Horse Designs, Another Media, Obscenic, Mercy, Hive Collective, Jon Hillcock’s New Noise, UR BEATZ, Seven Streets and Liverpool Live – and of course these special pink pages Bido Lito! And the prize? It’s a little belter. Sandhills Studio is offering a day’s free recording time with a top producer, while the winners will play next year’s Liverpool Sound City and Liverpool Music Week. Vice Magazine, meanwhile, has asked Getintothis to promote an exclusive gig at their London-based bar, The Old Blue Last, featuring the winners. On top of this, film-maker Ian Gamester, who has been shortlisted for the prestigious Virgin Media Shorts film, will make the band’s video promo which will be screened in FACT‘s boutique Box cinema for the winners and their nearest and dearest. Further goodies from sponsors will be announced in the coming months. 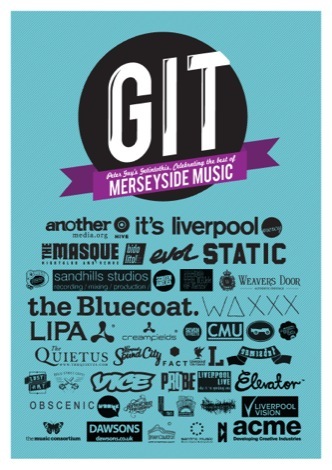 The GIT Award had its official launch at Liverpool Music Week’s spectacular closing party. The 12 nominees will be announced next spring before the winner is unveiled prior to Liverpool Sound City 2012 where they will feature on the Getintothis stage. 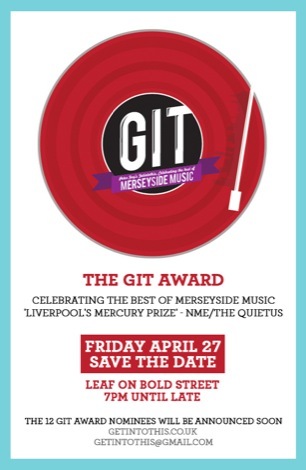 In the meantime, spread the word, The GIT Award is officially ON – musicians, bands and creative types everywhere, send your four tracks to getintothis@gmail.com or alternatively post to Peter Guy, The GIT Award, Liverpool Daily Post & ECHO, PO Box 48, Old Hall Street, Liverpool, L693EB.